The U.S. Department of Housing and Urban Development says 62% of homeless are sleeping on streets. More than half of Oregon's homeless spend each night without safe haven or harbor. Statewide, 62 percent of the homeless population was found to be living in unsheltered conditions at last count — including everything from makeshift camps to parked cars or crowded city sidewalks. That means Oregon ranks second across the nation for unsheltered homeless, topped only by California. The findings, included in the 2018 annual Homeless Assessment Report by the U.S. Department of Housing and Urban Development, cast a ray of gloom on what was otherwise a banner year for announcements of affordable housing projects and cheerleading by local officials. "It doesn't surprise me at all," said Brandi Tuck, executive director of Portland Homeless Family Solutions. "We continue to not have enough for all the families and people who need a place to live." Tuck cautions that HUD's calculations rely on Point in Time counts — totals amassed by squads of volunteers over the course of 24 hours that may not be completely accurate. The federal government's numbers could be skewed by the lack of a Point in Time count this year in Multnomah County, Oregon's most populous county, as well. She also blames HUD for a "disinvestment" in housing projects that began in the 1980s. "We are going to continue to struggle until we have a federal solution to help the whole country out of this challenge," Tuck said. "As much as we want him to, (Portland Mayor) Ted Wheeler cannot solve this problem by himself." A spokesman for the Joint Office of Homeless Services, which partners with Portland and Multnomah County, said the local 2017 Point in Time count actually found a 15 percent decrease in the number of homeless since 2015. The spokesman, Denis Theriault, highlights that 6,000 people exited homelessness the last fiscal year due to the group's efforts. "Oregon's numbers would look worse if not for Portland and Multnomah County's work in recent years to double shelter capacity," he said. "But even shelters aren't an answer if people staying in them struggle to leave because they can't afford the rent, even with jobs or disability payments." While homelessness in Oregon is most frequently associated with Portland, the state's largest city, and Multnomah County, which includes both most of Portland and several lower-income cities like Gresham and Troutdale, suburban and rural areas in places like Washington County are also grappling with the issue. Washington County, which is second in population in the state to neighboring Multnomah County, recently wrapped up an ambitiously named 10-year "plan to end homelessness." But county officials acknowledged in late 2017, midway through the 10-year plan's final year, that while homelessness in Washington County has not increased during that time, in the words of program coordinator Annette Evans, "It's not appreciably getting better." Overnight shelters run by local churches and supported by Washington County are open during the winter months in Hillsboro, Forest Grove, Cornelius, Beaverton and other local cities. The most robust is the Shelter at Orenco Station (SOS), which is open for 90 straight days from December through February at Sonrise Church, 6701 N.E. Campus Way in Hillsboro. The Forest Grove United Church of Christ and Emanuel Lutheran Church in Cornelius each also host shelter two nights per week, on Mondays and Tuesdays in Forest Grove and Wednesdays and Thursdays in Cornelius, from November through March. • Oregon has an estimated homeless population of 14,476. The only states with higher tallies are California with 129,972, New York with 91,897, Florida with 31,030, Texas with 25,310, Washington state with 22,304 and Massachusetts with 20,068. • The number of homeless living in Oregon has increased by 12.8 percent — or 1,268 people — since 2007. 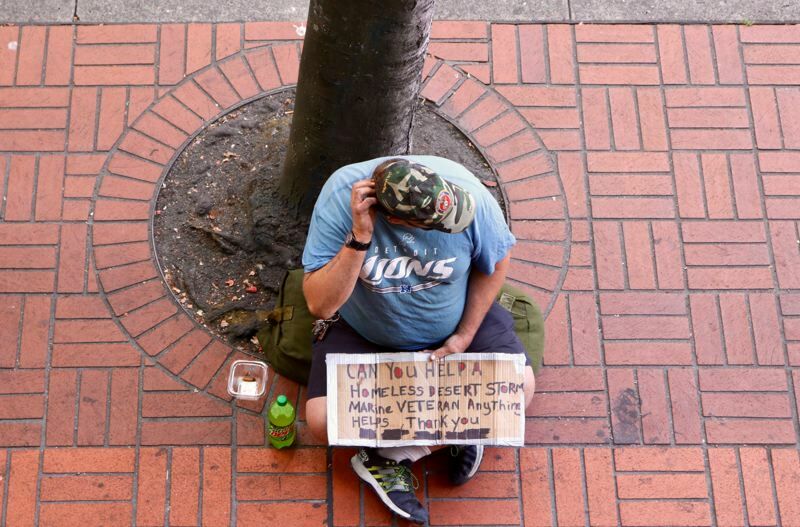 • During the last count, 56 percent of homeless veterans were considered unsheltered. • Of those considered to be chronically homeless in Oregon, 78.5 percent or 3,151 were unsheltered. Tuck cautions that the HUD's calculations rely on Point in Time counts — totals amassed by squads of volunteers over the course of 24 hours that may not be completely accurate. The feds' numbers could be skewed by the lack of a Point in Time count this year in Multnomah County as well. "We are going to continue to struggle until we have a federal solution to help the whole country out of this challenge," Tuck said. "As much as we want him to, Ted Wheeler can not solve this problem by himself." A spokesman for the Joint Office of Homeless Services, which partners Portland and Multnomah County, said the local 2017 Point in Time count actually found a 15 percent decrease in the number of homeless since 2015. The spokesman, Denis Theriault, highlights that 6,000 people exited homelessness last fiscal year due to the group's efforts: "Oregon's numbers would look worse if not for Portland and Multnomah County's work in recent years to double shelter capacity," he said. "But even shelters aren't an answer if people staying in them struggle to leave because they can't afford the rent, even with jobs or disability payments." Mark Miller and Peter Wong contributed to this report.